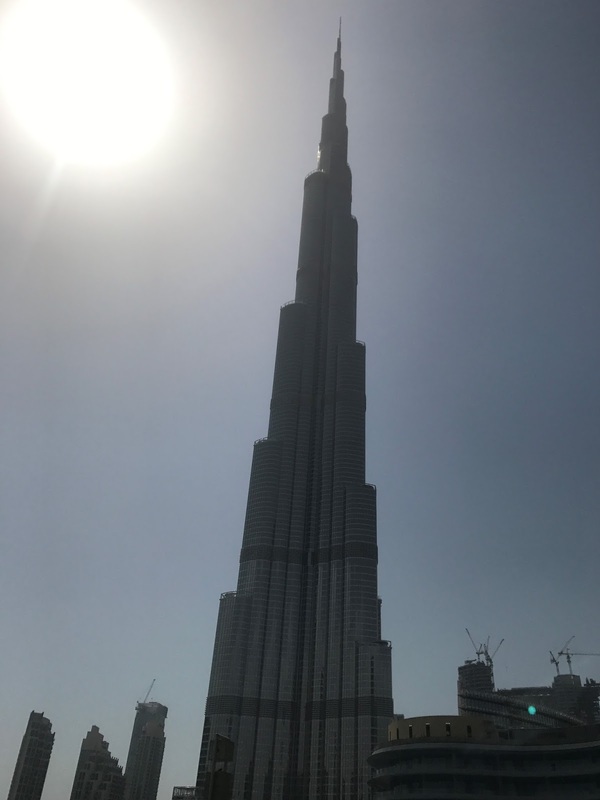 I got to spend a few days in Dubai recently, with my husband currently working in Saudi Arabia it is one of several more convenient locations in the region for us to meet up when the opportunity arises. My last visit to Dubai was nearly six years ago, when we went there on our honeymoon so it was good to go back again. Much of the trip was really just about relaxing and catching up but we did have one touristy day, returning to the viewing platforms at the Burj Khalifa. We did this when we were in Dubai previously and it's worth doing if you're there. In fact it was only when I was up there previously that I truly appreciated that Dubai is in the middle of the desert. The white sandy covering over the land looking almost like a dusting of snow when viewed from so high up, but with temperatures on this visit reaching the 40s and with a 'feels like' of 50°c on one day there clearly was no snow around! There are three observation decks in the building, on the 148th floor, 125th floor and 124th floor. If you wish to access all three floors it does cost more than a standard ticket which only gives you access to the two lower levels. You can buy tickets in advance or just turn up but I imagine at busy times this could potentially mean having to wait to access the floors. We just turned up on this occasion and although it wasn't actually our plan we ended up buying tickets for access to all three levels, clever selling by the lady who served us! However if you do that you do get a small gift after you've paid and before going up are shown into a separate airport style lounge where you can relax and enjoy some tea and dates whilst you wait. When it's time to ascend to the top you're looked after and taken up by a guide, plus you also get to skip the queues for the regular lifts at the bottom and likewise when you're going down you get to fast track the queues. When you arrive at the 148th floor there are more refreshments awaiting you, then you can enjoy this super high vantage point, including an outdoor area, the world's highest outdoor observation deck, for as long as you wish before descending to the lower levels. At every level you can, if you wish, have your photo taken to buy later and, of course, there are plenty of souvenirs to buy as well. There are also several interactive experiences allowing you the chance to learn more about the building of the Burj Khalifa and to read more about what you can see as you look down across Dubai. You can also enjoy a different view of the city with the bird's eye view attraction on the lower levels. The views over the city and beyond are very impressive and the clearer the day when you go up the better. On this occasion visibility close up was pretty good but further away it was quite hazy. The city is a great contrast of skyscrapers and low rise buildings to expanses of seeming nothingness, all on top of each other. From above I'm not sure I'd describe it as conventionally beautiful and I don't think there are the same volume of historical or iconic buildings to see (you're in one of them), like many other cities have but it's certainly quite something to be up so high looking down on everything. It looks like a model town stretched out below you and as I said before, like it's covered in a dusting of snow rather than sand. I imagine it would be a pretty amazing sight by night with all the buildings lit up. If you just want to see the views then you probably don't need to pay the extra to go all the way up to the 148th floor but for a really special occasion and a little more personalised experience then going up to the highest viewing level is definitely something to think about when planning your visit. Alternatively if you want to beat the crowds for some good photo opportunities than paying the extra might be worth it as there are considerably fewer people on the 148th floor as opposed to the other two. Nonetheless though whatever you choose this is a fun thing to do if you're a visitor to Dubai. Have you been 'At the Top'?